Hello my name is MR and I am going to tell you about me, so let's do this! I like to watch scary movie clips like IT or the new Jigsaw. I also I like to knock on my friends' doors and ask them if they can play. I am 8 years old, soon to be 9 and my BFF is a little girl named J. My class is 3R and Mrs. Ragosta is the best teacher! She loves Mickey and Minnie. 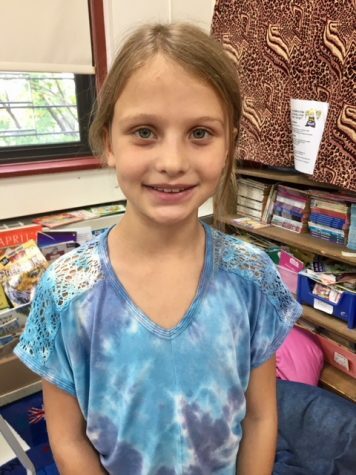 My favorite subjects in school are writing and math, and that is why I am doing the Newspaper Club. I LOVE sugar cookies, they are so good! I just came back from a vacation I will never forget. It was Disney World. The theme of my vacation was Stitch. I love Stitch. I have a love/hate relationship with my brother, MR. He loves the Yankees, hockey, and baseball. He is only 6 years old. As Rebeca Perram says,"Thanks for tuning in, but I have to tune out... bye!"